Reading Labels: Which pack of mozzarella would you buy? You’re in the grocery store. You need to buy some cheese. You decide on mozzarella. Now, which pack of mozzarella do you buy? 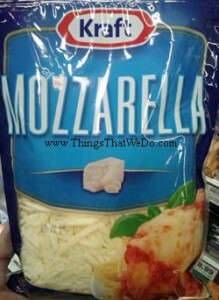 Do you get a block of mozzarella or do you go for the shredded stuff? You stand and ponder. The shredded mozzarella certainly seems easier to use. It’s already shredded so you can just sprinkle it on pita for a quick and easy pizza or add it to a tortilla for a quesadilla. You lean towards the shredded mozzarella but wait. Did you read the ingredients on the package of shredded mozzarella yet? Yogurt, an instant quick and easy breakfast, snack, or dessert what’s not to love about it? Lately, it seems as if the marketplace has exploded with a million different types of yogurt. It’s been a while since I last tested a yogurt so I thought I’d give the Liberte Certified Organic 2.5 Percent Plain Yogurt a try. I’ve reviewed some of their other products before in the past with mixed feelings. Some I liked, some not so much. 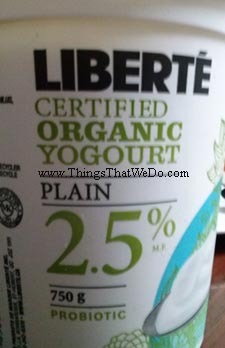 Which way will the Liberte Certified Organic 2.5 Percent Plain Yogurt fall? Let’s find out. 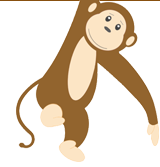 Copyright© 2013 ThingsThatWeDo.com. All Rights Reserved. A while back the folks at L’Ancentre sent me a test package with a variety of cheeses and butters. As of right now, I’ve tested all the cheeses but have yet to get at the butters. I waited until the very end to try out the L’Ancentre Emmental Swiss cheese. You see, I recognized the other cheeses, ranging from mild cheddars to deep rich aged cheddars but I’ve never had Emmental before. I don’t even KNOW what Emmental is. The closest thing I know to Emmental is Emmet and that’s a guy’s name. Thus, my apprehension yet excitement to try it. I saved the most novel cheese to the last so that I could focus only on it and nothing else. Those of you who’ve had Emmental cheese before might think I’m crazy but hey, this will be the first time I’ve ever had it. Question is: how does the L’Ancentre Emmental Swiss cheese taste? Do you like cheese because I like cheese. I like cheese a lot. Cheese might as well be my middle name so you can imagine how ecstatic I was a little while back when the lovely folks at L’Ancentre sent me a test package of their cheeses and butters. Today’s post is dedicated to the L’Ancentre 5 year cheddar cheese. I’m not even going to follow regular ThingsThatWeDo.com post protocol. I’m just going to flat out tell you that this L’Ancentre 5 year cheddar cheese is delicious. If you love those extra old sharp cheddars, then you NEED to try the L’Ancentre 5 year cheddar cheese. Yogurt, yogurt, yogurt, yogurt….mmm, often an easy snack but it’s not always easy to decide which one to buy. There are so many choices now that you just can’t help but do a little tasting from different brands. 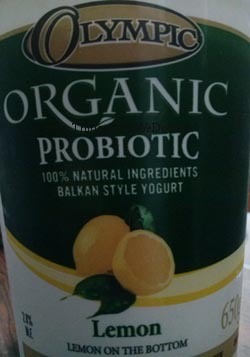 For today’s product review, our family opted to try the Olympic organic probiotic lemon yogurt. It was on sale and with my kid’s current interest in lemon, this was a surefire way to get her input on it too. The Olympic organic probiotic lemon yogurt seems to have potential. It’s organic, it’s got probiotics, it should be good. Right? 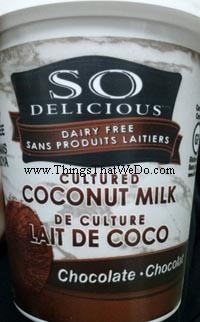 I was intrigued when I first saw the So Delicious Cultured Coconut Milk. Hey, a different way to eat coconut, I think to myself. It’s pricey, almost $6, but I’m tempted and it looks like it’s decent and hey, it’s even got chocolate which might entice my kid to try it. What could go wrong? I like coconut, my kid likes coconut, it’s got some good stuff in it, we should be smooth sailing from here on in, right? As you may have gathered from recent posts, my kid has been in to all things lemon and lime. A while back, I reviewed the PC Fruit on the Bottom Lemon Greek Yogurt which my daughter liked but I found a tad gross. It was much too sweet and just didn’t work for me. 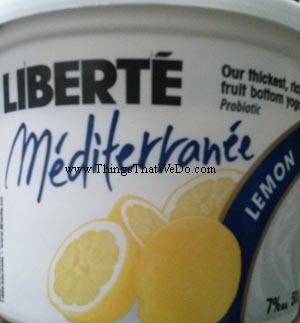 Enter Liberte Mediterranee lemon yogurt. I don’t know what to expect. I was a bit ticked with the PC Fruit on the Bottom Lemon Greek Yogurt for having 16 grams of sugar and yet here is the Liberte Mediterranee lemon yogurt and it’s got 23 grams! We’re going to test out the Liberte Mediterranee lemon yogurt and find out why it needs that 23 grams of sugar but I’m already a bit irritated and we haven’t even tried it yet. Have you tried: L’Ancetre organic light mild cheddar cheese and organic medium cheddar cheese? A little while back I received a package from the makers of L’Ancetre cheese. I was over the moon! I love cheese but I have to admit, I’m also a tad picky about my cheese. Am I a connoisseur? Nope. Do I love cheese? Yep. The difference? I can’t tell you all the notes and fragrances that are in the different varieties of cheese but I can and will rave about the cheeses that I do love. 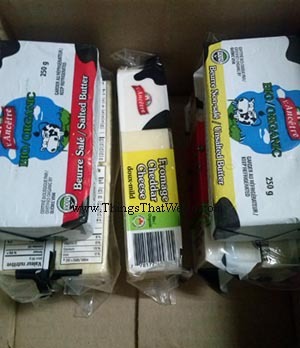 For today’s post, both the L’Ancetre organic light mild cheddar cheese and the L’Ancetre organic medium cheddar cheese will be reviewed. Now that I’ve tried 3 of their cheeses, I think I can do a pretty good compare and contrast. One thing is for sure, L’Ancetre has a lot to choose from! Guess what arrived? L’Ancentre L’Ancentre L’Ancentre! A few weeks ago I did a review on the L’Ancentre extra sharp cheddar cheese. I loved its richness, its sharpness, and its signature twang. I tend to write reviews but I rarely let companies know because I write them as opinion pieces for other fellow consumers. Yet, lo and behold the folks at L’Ancentre connected with me and offered some of their products for me to try. I graciously accepted and couldn’t be happier when the goodies arrived. I love cheese and butter but I love good quality cheese and butter even more. I can’t wait to try all these different products and let you all know how each one fares. Fingers crossed they live up to my L’Ancentre expectations. After trying their L’Ancentre extra sharp cheddar cheese I’ve got high hopes for the rest of their product line but those are big shoes to fill! Guess what? PC has another new Greek yogurt. Allow me to introduce you to PC Fruit on the Bottom Lemon Greek yogurt. My kid actually spotted it on a recent trip to our local Loblaws. She’s a big fan of lemons so when she saw the word lemon, she was tempted to try the PC Fruit on the Bottom Lemon Greek yogurt even though she’s not even a big fan of Greek yogurt! I read the ingredients and figured it was well worth a try so let’s just see how this new PC yogurt tastes. 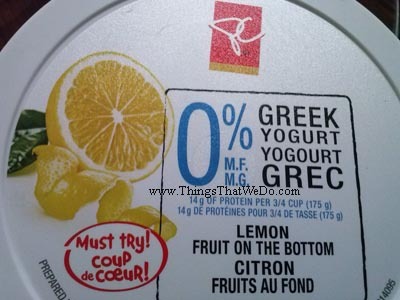 Who knows, my kid might just get a kick out of this new PC Fruit on the Bottom Lemon Greek yogurt!